Cuddles of Luv . . .: Happy Birthday KRIS ! ! ! ! Happy Birthday KRIS ! ! ! ! YOUR SPECIAL DAY... HAPPY BIRTHDAY KRIS ! It's Krista Palakiko's birthday today and a few of us are throwing her a surprise birthday blog hop. If you've come here from Christy's blog then you are on the right path, but if you just popped in you might want to hop on over to the beginning at the Lollipop Crafts blog. Why? Well one lucky hopper will win a SURPRISE PRIZE! All you need to do is hop along to each friend’s blog, leave some love, then head back to the Lollipop Crafts blog and let them know you completed the hop. Who knows maybe along the way some of Kris' friends might be giving away RAKS of their own, so make sure you stop and give some love to everyone. The winner will be announced on Sunday, March 18th. **If you get lost along the way the MASTER LIST is on the Lollipop Crafts Blog. For Kris' card, the image is TGF's HG Sing (retired stamp). I know how much Kris love the TGF cuties, and can't you just imagine our wonderful friend holding a ukelele and singing some fun songs! Kris, you always bring so much happiness and love to others, so today you deserve to be treated like a princess! Big HUGS to you!! Ok... continue along the hop and be sure to stop by Kris' blog to leave her some birthday wishes! Fabulous card!! Love the softer colors, so pretty! Aw Mimi, she is going to love it. I want it!! hahaha! Love the color scheme, totally reminds me of Hawaii. Wonderful job! She look adorable... Fabby birtday creation. Love it! That is a sweet, sweet card! Such an adorable little stamp! Beautiful card, love the colours! TFS! What an awesome card! Everything from the coloring to the layout of the card is beautifully done. I also love that you used one of my favorite GF stamps. Awww Mimi! Super sweet! Luv this image of HG Sing, perfect for Kris! Hope all is well with ya! 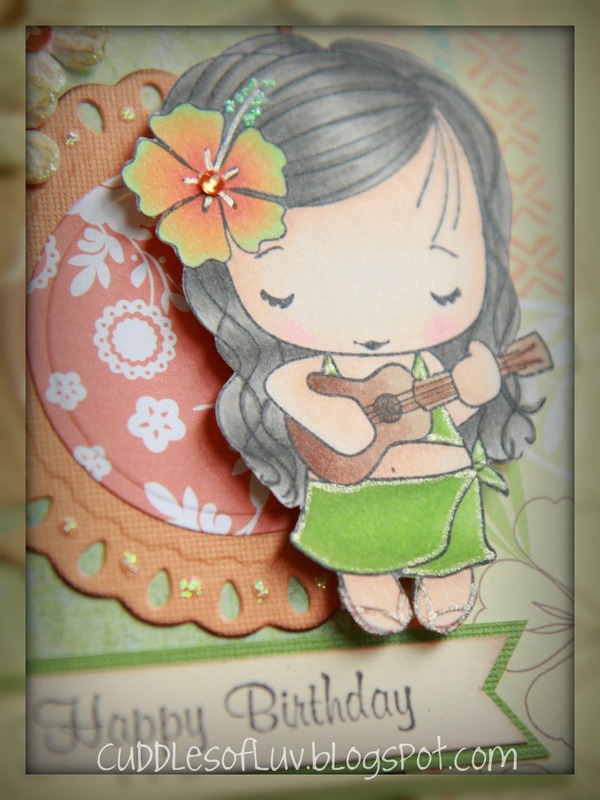 Such a sweet card and what is more fitting than to use HG-SING from TGF! So cute! The perfect bday card for Kris! Beautiful card for Kris! Love the look! So pretty! Perfect card for Kris! OMG...... 1st reaction: I WANT that stamp ....... 2nd reaction: OH NO.... it's retired !!! I love this card. I can think of so many things I can do with it. I will be on a hunt for the stamp. Happy happy birthday to you too.. Stopping by again on Friday to wish you a very happy birthday!! Awww....this is adorable! Love the TGF girl! Happy Birthday to you and your friend! Thanks for sharing this cutie with us at Birthday Sundaes! She is so cute and your card totally makes me think Hawaii, such an awesome card for Kris! 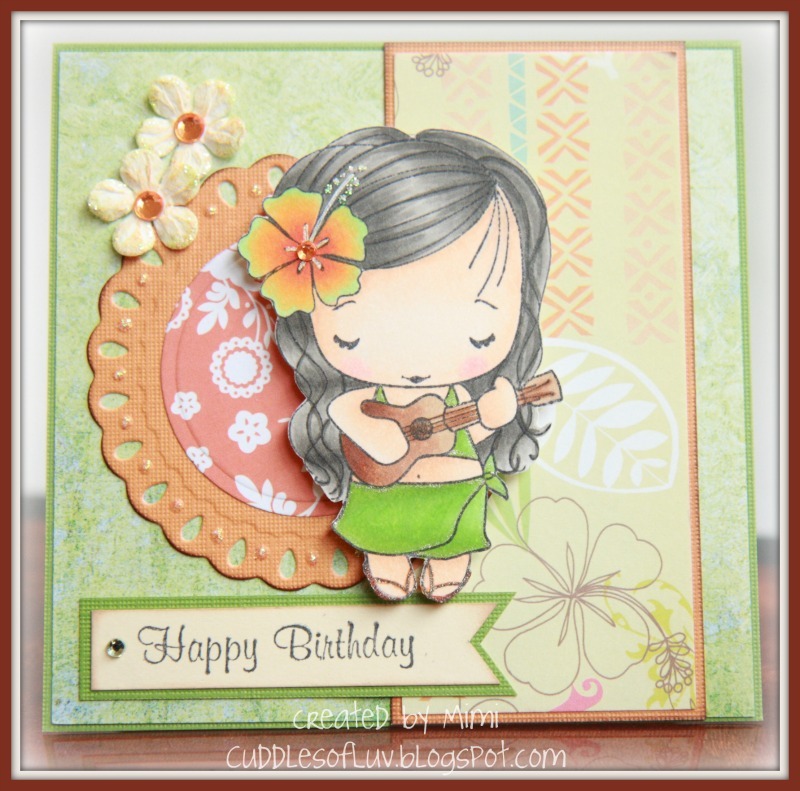 Gorgeous card Mimi, super cute image and beautifully coloured.